In this first installment in this series, we will look at Biblical Christianity. 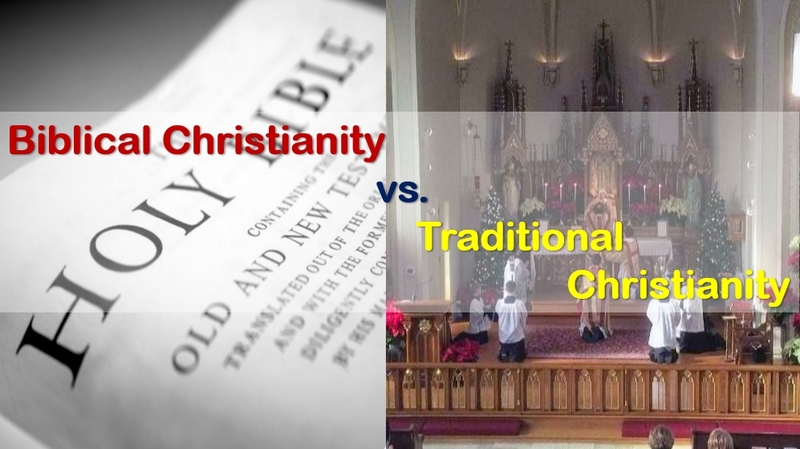 In the second we will look at Traditional Christianity. A Question to set the tone for this investigation: If the apostles Paul, Peter, and John were to, somehow, be transported (miraculously) through time – from their time to our time, today, would they find the True, Biblical, Christian Faith that they planted and sacrificed their lives to spread – OR – would they find some other “version” of it that they might not recognize? If they were to visit all the churches in our area in which we live, yes, even your area, reader … would they find “The Faith” that they spread, wrote about, defended, upheld, and died for? Would the Gospel of Jesus Christ that they planted be found, today, thriving in our countries, states, counties, cities, villages, towns, and communities? As Jesus said, in Luke 18:8 – “… when the Son of Man comes [i.e. returns], will He really find the Faith on the earth?” Will “The Faith” (the Biblical Beliefs, Practices, Mission, etc. of the Body of Christ, based upon the Bible, alone, being lived out, just like the early church as seen in the book of Acts) be found here on earth when Christ comes back? It is a rhetorical question … which would lead the reader to the answer of NO. There may not be much Faith in Christ when Christ returns, is the suggestion of that text of Luke 18:1-8, sadly. Therefore we must give the more earnest HEED to the things we have HEARD, lest we DRIFT away. 2 For if the word spoken through angels proved steadfast, and every transgression and disobedience received a just reward, 3 how shall we escape IF we NEGLECT so great a salvation, which at the first began to be spoken by the LORD, and was confirmed to us by those who heard Him [i.e. : the apostles] ,4 God also bearing witness both with signs and wonders, with various miracles, and gifts of the Holy Spirit, according to His own will? Does Jude 1:3 help us to answer the question: Are we are to follow Jesus Christ according to the Bible, alone, – OR – Are we to follow Jesus Christ according the Bible – plus – man-made, religious traditions? Jude 1:3 helps us to focus on “the FAITH” … that body of Beliefs and Practices of which Christians hold to as their own. Is it still evolving? Is it still changing and adapting? Or is it a settled set of beliefs and practices? In Jude 1:3 – the phrase “once for all delivered unto the saints (holy ones)“ seems to answer this question well. The implications are clear. Once, the last living apostle dies, that’s it. It is finished, delivered unto the church. Once, the apostle John died, around 110 A.D., that was it. His last book that he wrote was the book of Revelation. He had just finished 1st, 2nd, and 3rd John, and years prior, he finished the Gospel according to John. Once, that last living apostle died, there was not going to be any more new Christian Revelation from God to the church. Jesus commissioned the apostles, in John 14 thru 16 to be those who would write the New Testament, and under their direction, it was written. It is the Word of God. Thus, the “body of beliefs and practices” was complete for the New Covenant in Christ, the church of Jesus Christ. It was delivered, once, and for all – once, and for all time, and once, and for all Christians. All Scripture is inspired by God and is profitable for teaching, for rebuking, for correcting, for training in righteousness, 17 so that the man of God may be COMPLETE, thoroughly equipped for every good work. Based on these and other passages, the Bible is enough for the basis of our Faith in Christ, to live for Him, to obey Him, and to spread our Faith to the lost. The very passage of Holy Scripture that most Christians use to explain the Gospel of Christ, is very telling indeed. 3 For I delivered to you as of first importance what I also RECEIVED, that Christ died for our sins ACCORDING to the SCRIPTURES, 4 and that He was buried, and that He was raised on the third day ACCORDING to the SCRIPTURES, 5 and that He appeared to Cephas (i.e. : Peter), then to the twelve. If the Gospel of Jesus Christ, the message of salvation for the lost – is to, ONLY, be ACCORDING to the SCRIPTURES, shouldn’t everything else that relates to LIVING for Christ, after the lost are saved, be, ONLY, ACCORDING to the SCRIPTURES? That which the church teaches, preaches, promotes, supports, defends, and spreads … shouldn’t it ALL be, ONLY, ACCORDING to the SCRIPTURES? The apostolic, early church, while the apostles were still alive, all the way into 110 A.D., only, lived according to the Holy Scriptures. The church was spreading all over the Roman Empire, all over the Middle East, and Eastward toward China and Eastern Asia, etc. During that apostolic age, while the apostles were still living, the disciples of the apostles, such as Polycarp, Clement, Ignatius, and others, were known as the Apostolic Fathers. We have many of their writings. These are very highly valuable for clarification of Biblical texts, just as archaeological and historical considerations are. But, these are by, no means used as Primary texts. These are only used for clarifications and confirmations regarding unclear passages in the Bible. What these writings prove is that the Biblical text, is enough, and was the basis, the only basis, for Christianity, their Faith, that they were spreading. Their writing, the Apostolic Fathers’ writings, explain that they understood what the Apostles were teaching them, while those same Apostles were still living. These Apostolic Fathers’s writings help to confirm, that SOLA SCRIPTURA was what they lived by, even then. How should we live for Christ? Answer: Only, according to the Bible. How should we approach the reading, the studying and the application of Holy Scripture, so that we are obedient to Christ? We need to follow Christ according to the Holy Word of God, that relates to us. “Relates to us”? Yes, that which relates to us, who are in Christ, in the New Covenant. We are not to follow God, according to Moses, according to the Old Covenant, the Mosaic Covenant of God of Israel. For as many as are the promises of God, in Christ, they are yes; therefore also through Him is our Amen to the glory of God through us. Thus, not everything in Holy Scripture applies to us. We are to read, study, and know all of God’s Word, from cover to cover, recognizing, that not everything in the Bible applies to us, directly, as follower-disciples of Jesus Christ, in the New Covenant. But, there are Promises, Precepts, Principles, and Patterns that actually do apply to us, in Christ. For more on this, please, go to: The 3 P’s article. If we approach the Bible, in this way, we will have great joy in loving, following and obeying our Precious Savior and Lord, Jesus Christ. Next time, we will look at Traditional Christianity, in contrast to Biblical Christianity. You might be surprised to find out which one you are a part of. CLICK HERE to go to PART 2, of this investigation.